Today's post will provide a few links for tutorials and kits involving working with leather. Leather is not a material I have worked with much in bookbinding, but thankfully it is a material several of our members are very skilled with. Karleigh Jae of the same-titled shop has recently added some video tutorials on working with leather to her blog. 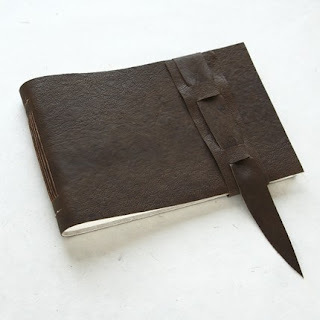 They include How to Iron Leather, Leather Cover for Coptic Stitch, and How to Make a Raised Design on a Leather Cover. Thanks Karleigh Jae for sharing these videos on your blog--you have demystified some aspects of working with leather for me! 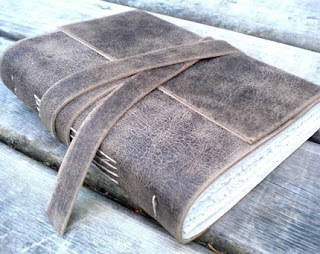 If you would prefer buying a kit to make your first leather journal, check out MyHandboundBooks where Rhonda has this Make Your Own Leather Journal--Bookbinding Kit. She notes that no previous bookbinding experience is necessary to make this book. If there are other members of BEST who have tutorials or kits related to leather, please post your links in the comments section. Making this book does require some skill in crafting, cutting, folding, tearing and sewing but if you are used to making things, you will find it straightforward. The instructions include useful tips on grain and on tearing paper and full-size printable templates for the cover and page stitching layout. The method I describe, enables you to make the book with mimimal equipment and measuring. Thanks for sharing those too!